Avjobs Helps Job Seekers Land Jobs FASTER! We provide the tools you need to achieve success! Your active engagement and participation enables you to identify opportunities and put your credentials in front of employers that are ready to hire. Commit to your future today! Avjobs is packed with exclusive, hands on tools that can set you apart from the competition. Our comprehensive site provides a variety of resources to help you move into the career of your dreams and build a better future for yourself and the aviation community. A win-win for everyone! Access complimentary resources including career overviews, newsletter, salary tables, higher education resources through Aviation Schools, RSS feeds, blog, professional assessment, aviation headlines, Aviation Ad Network for Advertisers or Publishers. Why should I pay when I can find jobs for free? Our staff and sales team work hard every day to bring you the latest aviation specific job opportunities in your area. Avjobs provides you with more vacancies than any other source. I already have a resume. Can I just copy and paste or download my existing resume to Avjobs? Avjobs does allow you to paste your existing resume into our system however it is not recommended because your credentials may not come back in employer resume search results. We recommend that you complete a Master Profile which will put you in the running for more opportunities. Yep. Although employers would hate to see you go, you can cancel your account at any time, (24/7), using your account control panel. Can you help me build a better resume? Yep. The Avjobs resume builder and publisher automatically creates your aviation specific resume and gives you the tools to quickly and easily publish, email, print and mail your resume. Can I view and apply for jobs with the Resume Hosting Membership? The Resume Hosting account is designed to build and host your aviation standards resume and get your credentials in front of employers who are sourcing resumes. You can view limited job detail and with an account upgrade, you can apply for jobs. How do I know if you have jobs in my area or jobs that I'm interested in? Can you help me with networking? Yep. Job Seekers have easy access to company specifics and link directly to employer websites. 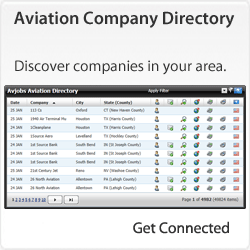 The Avjobs Aviation Directory is the largest library of aviation employer contact information, company profiles and direct link web pages. Fill your positions today with the best qualified aviation candidates! Avjobs offers a variety of solutions to meet your unique recruiting needs. Put your company, employment hiring brand and job vacancies in front of the aviation industry's top talent. Find candidates you like and with the click of a button print or save resumes, contact them directly or import candidate data directly into your applicant tracking system. From simply posting jobs and sourcing qualified candidate resumes, to a custom solution built around your needs, we provide the tools you need to be successful in your recruiting efforts. Reach a steady stream of high quality, industry specific candidates and professionals through a variety of registration levels. 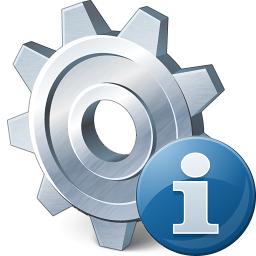 Employer Subscriptions provide unlimited access to all tools and features within the employer system. Increase the quality of new hires with a unique, in-depth look at a candidate's credentials beyond their resume. Avjobs candidates complete a 375 question job application which is 100% searchable. Efficiently search and quickly find candidate credentials by keyword(s), location, education, skillset, category, type rating, PIC and SIC time and more. In addition to the resume view, drill deep into their accomplishments, uncover salary history, convictions or violations of the law, positions held and specific duties, supervisor's names, education and training, licenses and certificates and special awards and honors earned. Also, pull supplemental detail for Pilots and Mechanics that traditional resumes do not provide. Additional tools within Employer Subscriptions include unlimited job postings, unlimited resume sourcing, job archival and retrieval, national new hire salary detail, sample job descriptions, branded job advertising, job post reporting, and broadcast messaging to newsletter subscribers. Custom Solutions are available upon request and offer a number of sophisticated auto job loading features that can be packaged together to create a solution designed and delivered based on your unique needs. Avjobs Cares Outplacement Program assists companies of all sizes and all affected personnel during organizational or personal transitions. Your affected employees receive a robust relief package giving them the opportunity to acquire employment in the aviation industry. Avjobs makes additional value-added features available with this service that are disclosed through the purchase process. We offer advertising solutions to give you additional exposure through the Aviation Ad Network advertising system, in our weekly newsletter, in the Aviation School Directory, and can provide inclusion in our Aviation Headline News service. We also have topic/page sponsorship opportunities available. Our exclusive Aviation Ad Network also offers the opportunity to earn money by becoming a Publisher and displaying industry only ads on your site. Our complimentary resources include: Aviation Directory listing inclusive of your corporate contact detail, social media links, RSS feeds and company profile. Search and compare salaries by job title and category. Additionally, Avjobs RSS feeds can be added to your website and blog to display our latest news items on your web pages as a value-added service to your visitors. Is there a limit on the number of resumes I can receive? Nope - Every plan we offer allows for unlimited responses. Can I include my company logo in my job posting? Yes - Company logos and/or a screenshot of your company website are automatically included in every job posting, unless the posting is marked as confidential. Nope, but you can experience the value of Avjobs by selecting any of our Monthly payment plans. Notify Avjobs of your intent to cancel 5 business days prior to your scheduled billing date and you'll only be charged for the current month. 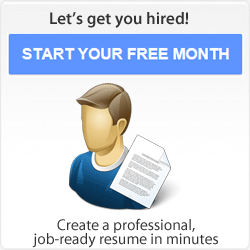 What is the Avjobs Resume Database? In addition to the unlimited candidates you can collect for your own posted jobs, you can also search our database of 100% active aviation resumes helping you find the perfect fit! The resume database contains active aviation candidates, seeking immediate placement. How do candidates apply for my jobs? Candidates are instructed to apply using your application instructions. Whether you prefer resumes by email, or require candidates to apply directly on your site, we've got you covered. What if I no one applies for my job? New job postings may take up to 24 business hours to gain maximum visibility after you have posted them. If you haven't received any candidates after this time period, please make sure your application instructions, phone number and/or email address are in the job posting and are correct. Many candidates may attempt to call, fax or email you directly while others will apply through the Avjobs system. We publish and distribute your jobs and provide the best advice we can about writing quality job titles and descriptions, but we can't take responsibility for results of your ad copy. The advertiser has ultimate responsibility for the job postings textual content. The advertiser is responsible for describing the job and crafting it in such a way that it resonates with the viewer, ideally producing an application. In the end, the quality of the copy affects the integrity of the posting and its ability to clearly and effectively attract applicants. Feel free to request our feedback on your job postings or other related questions. Can my sign in be shared with my coworkers? Sign in credentials may not be shared. All Employer account types include unlimited users. Additional users may be added after logging into your account. Can I see who has viewed my postings and how many times? Yes - With our job posting reporting and statistics modules you can see exactly who (registered users) has viewed your postings and how many times. The modules even tell you if the candidate has applied and gives you direct access to the candidates master profile, resume and contact information. Have more questions or special needs? Market your program or school and see an increase in enrollment! Since 2003, Avjobs generates high quality leads for the industry's higher educational facilities through our high traffic site. Aviation Schools, our Aviation Schools Directory provides you with a comprehensive profile listing and quality lead generation. Promote your college, university, flight school , training center etc. and allow future aviators to find and explore your facility today. Advertising exclusivity opportunities are also available within our highly trafficked career overviews. Give potential students the opportunity to reach their aviation goals, move their career ahead and ensure the successful future of the aviation industry. Put your training facility in front of the ambitious visitors today. What can I include in my school profile? Anything and everything necessary to help prospective students understand why they should choose your program or school. This is your opportunity to provide a detailed profile of your facility including mission statement, programs & degrees, certificates & licenses offered, tuition, fees, images, hyperlinks, downloads, etc. Can I update my profile any time I want? Yes. School profiles come with a username and password so you can make updates whenever you like. How do I get notified of student interest? Automatically via email - Student questions and expression of interest are passed on directly to admissions counselors and are accompanied by student profiles including specific area of interest and contact information. Schools can then perform follow-up enrollment activities. Promote your college, university, flight school or training center today. Direct access to aviation's top educators and our roster of industry job opportunities! As you plan for a future in aviation, knowing about different career options, choosing a higher educational facility, creating your first aviation standards resume, performing a job search and preparing for interviews are all important objectives. At Avjobs, we can help you reach your aviation career goals. Our comprehensive Career Guide provides thorough career overviews on over 70 different job titles all specific to the aviation industry. Learn educational requirements, who employs, complete job descriptions, typical responsibilities and duties, job outlook, salary and benefit details. Our Take Charge of your Future Today Career Guide is a must have for any student looking at starting a career in the aviation industry. The Aviation Schools Directory provides access to educational facilities specializing in aviation and gives you the ability to ask questions directly to admissions counselors and instructors. Our searchable directory provides the tools to explore aviation academies, universities, flight schools, training centers, seminars and more. The Avjobs Aviation Schools Directory is perfect for students looking to break into the industry or, for seasoned professionals looking for continuing education to cultivate their career. Applicant accounts give students the opportunity to create aviation standards resumes and get them in front of industry companies that are hiring. Once ready to start researching job opportunities and applying for jobs, students can apply directly to hiring managers. Students of aviation related programs are also eligible to receive 12 months of services free through Avjobs Student Discount. If you have an aviation related website, you can easily become a publisher of our exclusive Aviation Ad Network and make money simply by displaying aviation specific, ads on your site. For more information about becoming an Aviation Ad Network Publisher, visit the Aviation Ad Network. If I'm a student, can I get job seeker services for free? Yep. After your initial registration, Avjobs has discounts and/or a free service period available for students. You can access the discount program applications from your control panel after logging into your account. You can also read more about discount programs available to subscribers and the redemption process on the discount programs page. If I'm looking to advance my aviation career, can you help me locate schools? Yep. Our Aviation Schools Directory lists educational and training facilities that you can research and make direct contact with. Can Avjobs help me create my aviation resume? Our universal job application and resume builder creates a top-notch, aviation standards resume. You simply answer questions and our system does the rest! How do I learn more about aviation careers? 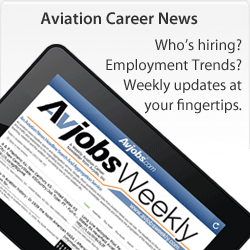 Visit the Aviation Jobs And Career Overview pages for help. Together, we can foster excitement and strengthen our industry. Avjobs considers anyone working toward the advancement of the aviation industry, a friend. Just like you would do with your own personal friends, Avjobs works alongside with you to achieve common goals. A win-win for everyone. Strategic relationships are an important part of our business and support a combined dedication to the future of the aviation industry, its workforce and success. We currently have partnerships through a variety of industry sectors to promote the advancement of aviation related products, services and employment opportunities. By joining forces, together we'll advance our shared objectives by providing and delivering best value to the aviation community in new ways! We invite and give industry leaders, companies, museums, magazines, organizations and associations the opportunity to team up with us and earn referral fees! Through the Avjobs Platinum Program, we'll work in collaboration and both take an active role to promote and expand our customer base. Platinum Program privileges include the ability to increase your customer base or membership, offer added value to existing member benefits and bring in additional revenue through member participation. Avjobs delivers high quality benefits at a tremendous savings through a discount you provide to your members. As your members take advantage of the benefit provided through the discount, Avjobs provides referral feels back to you! Have an idea on how we can work together? Contact us today so we can clearly define what we can do to help your business grow! Who does Avjobs partner with now? Avjobs has relationships with a variety of companies and organizations looking to accomplish common goals. We currently work with trade publications, museums, professional groups and associations. Are there any fees to setting up a partnership? Typically, when we join forces with another company, both parties share a common goal and our efforts are generally provided at no charge. In most cases, and depending on the partner relationship, expenses are handled by each entity individually. What can Avjobs do to help my company and/or my customers today? Avjobs works directly with our partners to find the best way to create additional value for their programs, products and services. We're always coming up with new and innovative ideas to help the industry grow. Contact us to see how we can help you today! Market to the aviation community with immediate impact! Avjobs offers powerful ways to market your aviation specific message to our high volume of loyal industry insiders, executives, visitors, users and publishers with immediate impact. Hiring managers and recruiters, advertise job vacancies to reach a steady stream of high quality, industry specific candidates and professionals through a variety of Employer service levels. Target specific audiences and geographical locations through keyword advertising with the Aviation Ad Network. This pay-per-click (PPC) advertising system offers multiple ad specifications including banners, text and text-image based ads. Select from over 80 unique aviation career overviews to get your ad on our most heavily trafficked pages. Our career pages are used by visitors doing research, looking at career opportunities, reading about requirements and wanting to know who trains and who hires. This advertising opportunity requires special set up so call us for more detail. Place your message in our newsletter and reach our opt-in subscriber list of over 30,000 aviation professionals. Send an individual email message and reach the attention of our opt-in subscriber list of over 30,000 aviation professionals. Get your product, service or job opportunity posted to Avjobs social media outlets like Facebook, Twitter, Google+, and LinkedIn to connect with our fans and followers. Promote your product, service or announcement on the Avjobs Blog. Your hard to fill aviation job vacancy is featured and delivered to more than 30,000 opt-in aviation professionals. Drive traffic and awareness to your product, service, article, announcement or headline news. Our aviation only news circuit reaches aviation professionals and provides them with news they can use. Expose your message to a broad audience that is both interested and engaged. Promote your RSS feeds and receive maximum benefit. Market training programs and attract new students. A comprehensive profile listing and lead generation are included. Job seekers looking for work, advertise their credentials using our exclusive aviation standards resume builder, and promote their resume and availability through our specific resume network. Whether you need to boost your resume and credentials, sales, website traffic, job opportunities, student enrollment etc., Avjobs has the perfect advertising opportunities available. Contact us today and put your message where it needs to be. Avjobs has a so many advertising choices. How do I know what is right for my needs? We understand that each company and organization has unique needs and that's why we offer targeted solutions that will get your message in front of the right people. Our staff can put together a package that includes one or multiple services. Can Avjobs help me reach a variety of aviation professionals? Yep. Avjobs gives advertisers the opportunity to grab the attention of a large audience including job seekers, executives, students, enthusiasts, professionals and end users. Our team of experts will work directly with you to determine the best solution for your unique needs. I'm not familiar with pay-per-click advertising so how do I know if Aviation Ad Network is for me? The Aviation Ad Network works for everyone and allows you to target specific audiences and find the exact customer you're looking for. With this pay-per-click advertising system, you can easily customize and display your choice of ad styles and layouts including banners, text and text-image based ads. Open account with just $5.00 and create ads and set up a campaign in just a few minutes. No contracts and no long term commitment. My company has exposure through our own social media outlets and blog. Why would we want to post through Avjobs social media outlets or blog? Avjobs provides exposure through a variety of our corporate social media outlets getting your message in front of our subscribers. Contact our team today and we'll answer all your questions. Display Aviation Ads And Start Earning Money Today! If you have a website or run a blog in the aviation industry, we invite you to become a Publisher with our exclusive Aviation Ad Network. The Aviation Ad Network Publisher program delivers aviation ads to websites, then pays publishers based on user clicks on ads. Grow your business and earn money for driving traffic with aviation specific pay-per-click ads. Aviation Ad Network will connect and serve relevant, high quality ads on your web site or blog that your visitors find value in and you get paid for each valid click from your visitors. Avjobs offers a number of ways you can add value and get more from your website or blog. You have complete control over the ad formats and where you want to display them. Tap into the Aviation Ad Network today. It's free to sign up as a Publisher, so get started now! The proprietary context technologies and aviation only ads are the foundation for Aviation Ad Network. We understand the context and content of webpages and precisely match aviation ads to your pages. Aviation Ad Network delivers easy to read text, image-text and banner-based ads targeted to the content of your pages and Aviation Ad Network for search queries. You decide what format and location is best on your pages. In addition to keyword-targeted ads, Aviation Ad Network also provides placement-targeted advertisements, offering pay-per-click ads that are specifically suited for your pages. Aviation Ad Network combines a context engine, filtering technology, and your input to create a robust set of filters that are right for you. Getting started with Aviation Ad Network is easy and requires no technical or coding resources on your side. We give you a few lines of HTML that you add to any of your webpages. It takes just minutes, after which you'll be serving Aviation Ad Network ads on your pages - and generating more advertising revenue. Aviation Ad Network is an aviation specific advertising network, and we do our best to ensure that all of our publishers are aviation related to protect the interests of our advertisers. How much does it cost to become a publisher? Becoming an Aviation Ad Network Publisher if free. Is it easy to get set-up as a publisher and how long does it take? Creating a publisher account is simple and only takes a few minutes to set-up. There is no set-up fee and no contract required. What are the advantages of becoming an Aviation Ad Network Publisher? We understand the context and content of webpages and precisely match aviation ads to your pages. The proprietary context technologies and aviation only ads are the foundation for Aviation Ad Network and delivers ads that will interest our users. Aviation Ad Network combines a context engine, filtering technology, and your input to create a robust set of filters that are right for you and your site. It takes just minutes, after which you'll be serving Aviation Ad Network ads on your pages - and generating more advertising revenue! I am not a web developer. How do I start running ads on my site or blog? 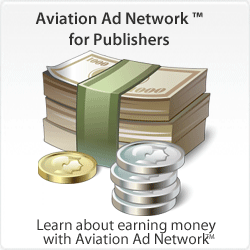 Aviation Ad Network for Publishers gives you all the detail and instructions you need to get started. Our easy to use interface automatically generates standardized ad blocks and you just copy and paste html code fragments into your page. Can I see how the ads are performing? Yep. With your Publisher account, you can sign in and view detailed reports, statistics and transaction history. Get more value from your website or blog and create your Publisher account today. Learn more and get started now.